White House officials and congressional aides emerged from talks aimed at ending a partial government shutdown over President Donald Trump's demands for border wall funding without a breakthrough Saturday, though they planned to return to the table the following day. Trump tweeted: "Not much headway made today." 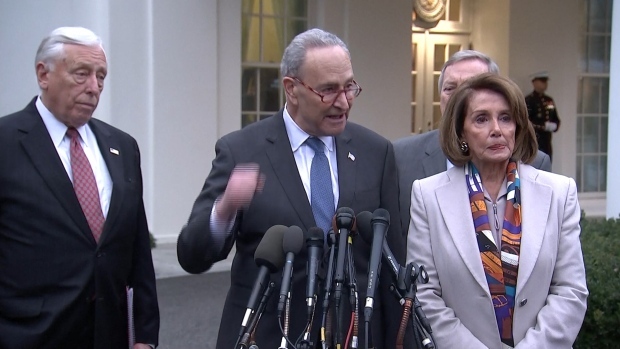 Democrats agreed there had been little movement, saying the White House did not budge on the demand for $5.6 billion and would not consider re-opening the government. The White House said funding was not discussed in-depth, but the administration was clear they needed funding for a wall and that they wanted to resolve the shutdown all at once. Accusations flew after the more than two-hour session led by Vice President Mike Pence. Acting chief of staff Mick Mulvaney, in an interview on CNN, accused Democrats of being there to "stall." 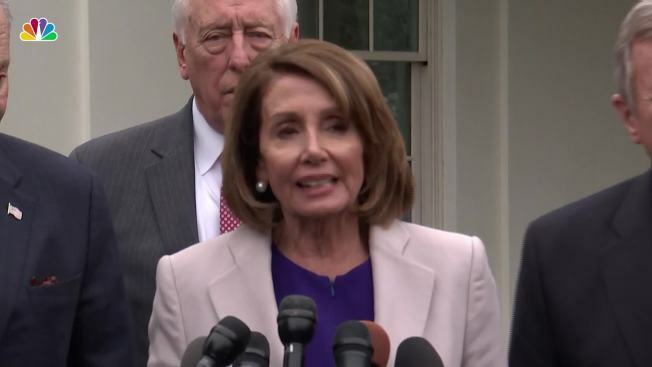 Democrats familiar with the meeting said the White House position was "untenable." A White House official also said the meeting included a briefing on border security by Homeland Security Secretary Kirstjen Nielsen. Democrats sought written details from the Department of Homeland Security on their budget needs, which the White House said it would provide. The group plans to meet again Sunday. Trump, who did not attend the discussions, spent the morning tweeting about border security. Showing little empathy for the hundreds of thousands of federal workers furloughed or working without pay, Trump declared — without citing evidence — that most are Democrats. He also asserted: "I want to stop the Shutdown as soon as we are in agreement on Strong Border Security! I am in the White House ready to go, where are the Dems?" One Democrat, Maryland Sen. Chris Van Hollen, said in his party's weekly radio address that the shutdown "is part of a larger pattern of a president who puts his personal whims and his effort to score political points before the needs of the American people. ... He is pointing fingers at everyone but himself." Trump and Democratic leaders met for roughly two hours Friday, but gave differing accounts of the session. Democrats reported little progress; Trump framed the weekend talks as a key step forward. As the shutdown drags on, some Republicans are growing increasingly nervous. Some GOP senators up for re-election in 2020, including Cory Gardner of Colorado and Susan Collins of Maine, who has tried to broker deals to end past stalemates, have voiced discomfort with the shutdown in recent days.. Sen. Thom Tillis of North Carolina penned an op-ed for The Hill, arguing that Congress should end the shutdown and make a deal on border security and immigration reforms. 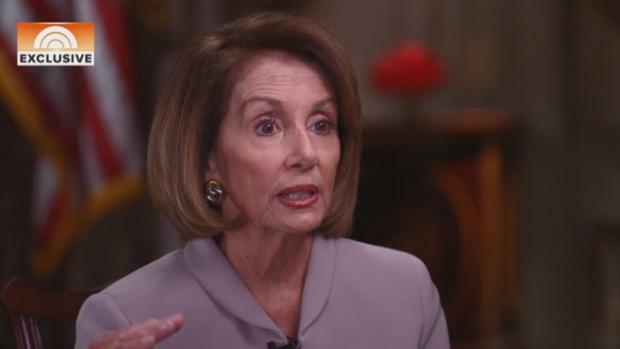 In calling on Trump to reopen government while negotiations on border security continue, Democrats have emphasized families unable to pay bills due to absent paychecks. But Trump has repeatedly said he will not budge without money for the wall. Trump asserted on Friday that he could declare a national emergency to build the wall without congressional approval, but would first try a "negotiated process." Trump previously described the situation at the border as a "national emergency" before he sent active-duty troops; critics described that as a pre-election stunt. Trump said the federal workers who are furloughed or working without pay would want him to "keep going" and fight for border security. Asked how people would manage without a financial safety net, he said: "The safety net is going to be having a strong border because we're going to be safe." Democrats expressed skepticism Friday that there would be a breakthrough. "It's very hard to see how progress will be made unless they open up the government," said Senate Democratic leader Chuck Schumer of New York. Trump confirmed to reporters that he privately told Democrats, in the Friday meeting with congressional leaders, that the shutdown could drag on for "months or even years." A variety of strategies are being floated inside and outside the White House. Among them is the idea of trading wall money for a deal on immigrants brought to the country as young people and now here illegally, But Trump made clear during his news conference that talk on DACA, the Deferred Action for Childhood Arrivals program, would have to wait.